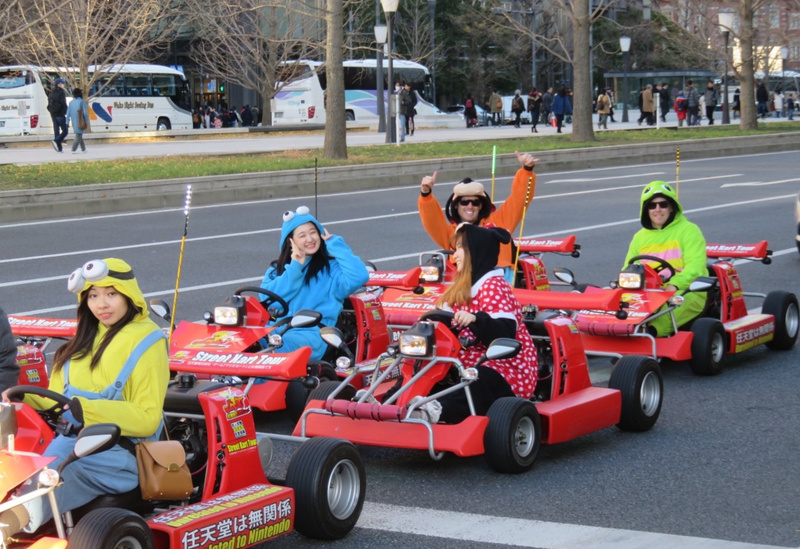 Random: Tokyo's Unofficial Mario Kart Service Really Wants You To Know It's "Unrelated To Nintendo"
Nintendo might have won the lawsuit against Tokyo's Mari Mobility company - formerly known as MariCar - but somehow the go-kart business continues to bite back. 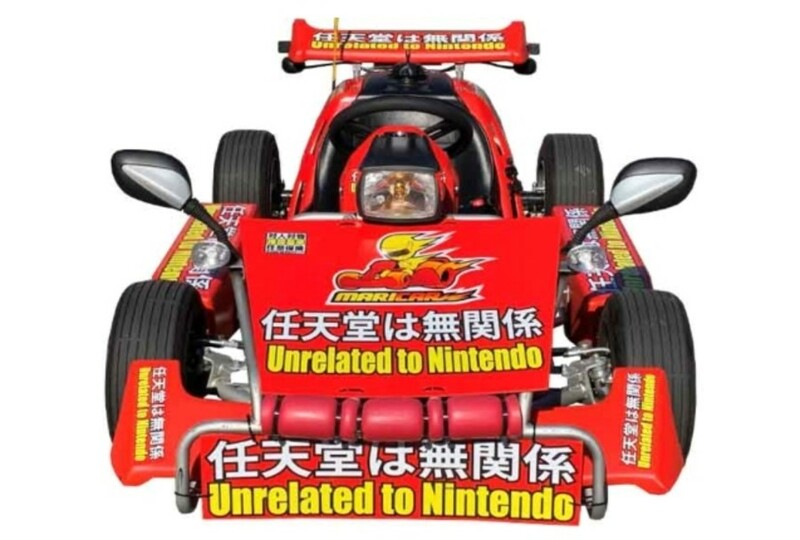 Even though the company was required to pay 10 million yen (roughly USD$88,000) in damages last year and immediately stop wearing Mario-themed outfits, it's now managed to take a seemingly passive-aggressive swipe at Nintendo by sticker bombing its small motorised vehicles with new graphics. Can you believe it's come to this? Tell us below. Imitation in the sincerest form of flattery. Too bad for them that Nintendo wasn't very flattered. They drive past my apartment countless times a day, and it used to be 95% Nintendo character costumes, the day after the lawsuit announcement it was suddenly nearly all minons and random Disney character costumes. You very rarely see a Nintendo character now, I wonder if the customers that wear Nintendo costumes now have to bring them themselves, or if they have just greatly limited the number of Nintendo costumes available. Either way, they have a poor reputation with locals but tourists absolutely adore the experience despite driving around in taxi and bus exhaust in a dank sweaty costume countless other people have worn, haha. That kinda works now. The intended effect was stopped after all. I feel like I should be calling them immature but I can’t help but laugh. That’s pretty high tier passive aggressiveness. This article is cringe worthy. It is not passive aggressive it is to prevent any further action from Nintendo and perfectly understandable from the business. Bloody hell Nintendo Life, try and screen your articles so rubbish like this doesn't get through. Nintendo really hates free marketing. The stickers have been on the karts for months now. Why is this being reported now? @SBandy You don't think that passive-aggressive? Every single side of the car has that message on it. @SBandy If they really wanted to distance themselves from Nintendo they wouldn't have written the word "Nintendo" on the side of their karts. This isn't just them complying with a court order, they're also goading Nintendo. "See, we're nothing to do with you, it says so. 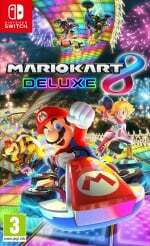 We just run Kart races with cartoon characters which happens to be a thing normally associated with Nintendo." Nope, for all we know that was a requirement to stop Nintendo taking further action. @Sandro89 They hate people that aren't Nintendo making money from Nintendo IPs without paying for the privilege. The free market isn't "I'm free to copy your stuff and make money off it" it's "I'm free to make my own stuff and market it" and "I'm free to strike a deal with the IP holder to use their IP". @SBandy I somehow doubt that. This is basically them putting up two fingers to Nintendo. You're literally the only person who seems to think otherwise. If they didn't write "unrelated to Nintendo" or "unrelated to Mario Kart" then people would assume they were so I don't see how it is possible to distance themselves without including it. A few people have agreed with my comment so I am literally not. And that isn't in doubt. @SBandy They'd do it just by removing all the Nintendo IP from their Karts. You're right, people would just assume they were still Nintendo related, but that would be better for their business. I guess the only way to be sure is find someone who understands Japanese and get them to research what the specific order was. I agree, certainly before assuming it is just passive aggresiveness. Looks like it isn't just Nintendo's IP they are ripping off, but others as well. But that still doesn't mean you can just take other people's IP to profit off of. When I grow up, I want to be a comic book writer. The first thing I will do is create a completely brand new original totally unique comic book character will be SpidurMann. It will be "unrelated to Marvel." I said it twice because of the stupid min word limit. Typical. I love Nintendo, but they can be very anti-consumer sometimes. Whether it be charging for Peer-2-Peer connections, taking down fan projects such as this one, releasing individual ports with little new content for full price or killing off franchises for no reason, it's just annoying and sometimes I wonder if such acts are going to backfire on them. P.S. I'm gonna get a lot of angry comments LOL. @TheAwesomeBowser To be fair, Sony and Microsoft also use P2P. And this wasn’t a fan project. @JackEatsSparrows Ah. Seemed like a fan project at first glance. @TheAwesomeBowser Nah, I could def understand that assumption. What with the none-too-safe idea of driving go karts into traffic. They’ve gotta have some pretty explicit injury waivers, haha. If I did this I would dress up as Conker just to mock Nintendo in this situation. So now they're going to be sued by Disney, Dreamworks, and PBS instead, huh? You have been bombarding comments sections the last two days just slagging off Nintendo. Plus "I love (insert company/person) but" is a pretty common phrase to use when someone just wants to start slagging said subject off. Disney hasnt really made a racing game since "mickeys speedway usa". soo....i think theyll be ok this time around. after all, those costumes at least in usa, are sold in walmart none the less, and you really shouldnt be sued for just wearing them. there technically onesies. and the carts themselves say maricar on them which doesnt sound anything disney like, so really nintendo is the only possible enemy to strike back again. @SBandy Sorry. Just trying to tell the truth. There really should be nothing wrong with that. If a company, say, releases ports individually for full price, I have no choice but to call them out. Why? Because if I don't call them out and buy said ports, the company will think it's okay, and will keep doing it. @Sandro89 Until someone has an accident (it’s on public roads) and the first thing in the media is ‘Nintendo Mario Kart thingo dangerous’ or something like that... Which is what Nintendo are ‘trying’ to avoid. ‘We’ know it’s not Nintendo, but many others may assume it was. This sticker is obviously rediculous though haha. Well bad news but your efforts are having no impact as many people are buying the games and enjoying them. Also did you not mention you wanted Mario Maker ported? @SBandy using my limited google-fu they were told to stop wearing the costumes, that's the only thing they were told. I can't see any other stipulation mentioned in the news stories, certainly nothing requiring a disclaimer on the Karts. So "passive aggressive" it is. Fair enough. I see it as them just covering their asses from future litigation. @SBandy I meant a sequel. Oh man. That really went over your head, didn't it? Wasn't the reason Nintendo didn't wanna be associated with this was because people were getting injured over this? It kind of works for anything! Can't tell if "passive aggressive" or the most on the nose legal defense attempt ever tried. It's usually hard to tell the difference between legit anti-lawsuit-ing and flipping off the target. I'm not sure if this is passive aggressive or if they probably had to put the "Unrelated to Nintendo" as part of the settlement. There's no such thing as bad publicity. 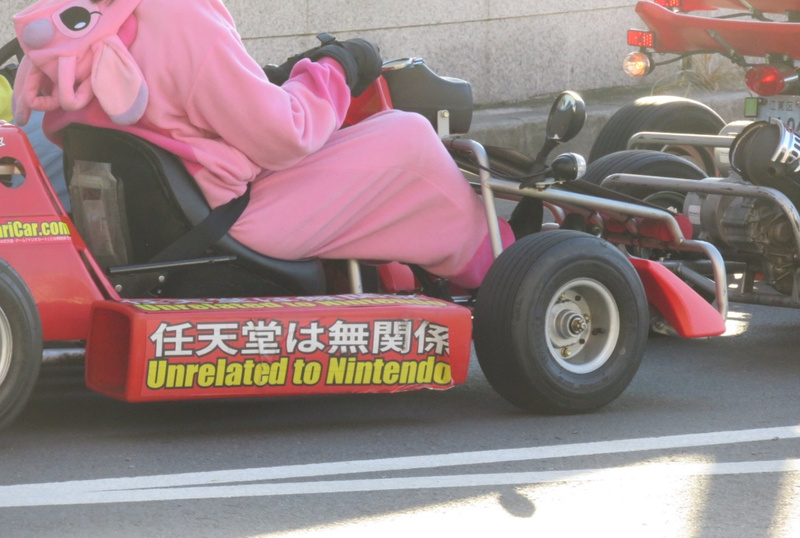 Besides, I heard non gamer friends talking about real life Mario Kart in Japan so yes, I do consider this to be good marketing for Nintendo. @Sandro89 There is such a thing as bad publicity. BFV and FO76 has had a lot of (mixed/negative) before/after launch. And both have had a hard time turning that publicity into good sales with both going on sale just a week or two after launch. And Maricar has had several accidents and are known for slowing down traffic, it looks like a brand withdraw to the casual consumer, even if they are not associated with this brand. This is great. They should go all out, and have 'unrelated to Nintendo' on everything: road markers, employees, the boss' wife, even on the 'unrelated to Nintendo' stickers themselves. Absolutely love immature reactions to quite an immature, or rather needlessly insecure action from Nintendo in this case.